Liveaboard boaters who don’t have the luxury of going south in the winter have a special dedication. These folks have some unique trials each winter and some exceptional joys that make it all worth it. The trials are not more demanding than the difficulties people who live in houses face in winter; they are just different, unknown, and therefore harder to address until you learn to deal with them. The adventure and joy of living aboard are well worth the winter challenges. The adventure and joy of living on a boat are well worth the winter challenges. We live aboard and have been forced to stay too far north until deep into autumn a couple of times, and it’s given me some appreciation for our friends who live aboard their boats year-round. One of our friends is a guy who grew up doing some serious sailing, spent some time in the Coast Guard, and has done all manner of jobs on the water. Another lady we know divorced some years ago and decided it was time to do what she’d always wanted to do and live on a boat. These people live aboard their boats all year and have for a number of years, and they love it. One of the ordeals all of us deal with in the winter is cabin fever, that stir crazy feeling we get from limited daylight and spending too much time indoors. That feeling can be worse with winter boat life, as it brings a lot more solitude than summer boat life. Marinas get mighty quiet in winter, and that solitude can be good or bad, depending on your perspective. It’s an opportunity to have some much valued quiet time or an opportunity to learn to value the neighborhood feel of the marina in the summer. 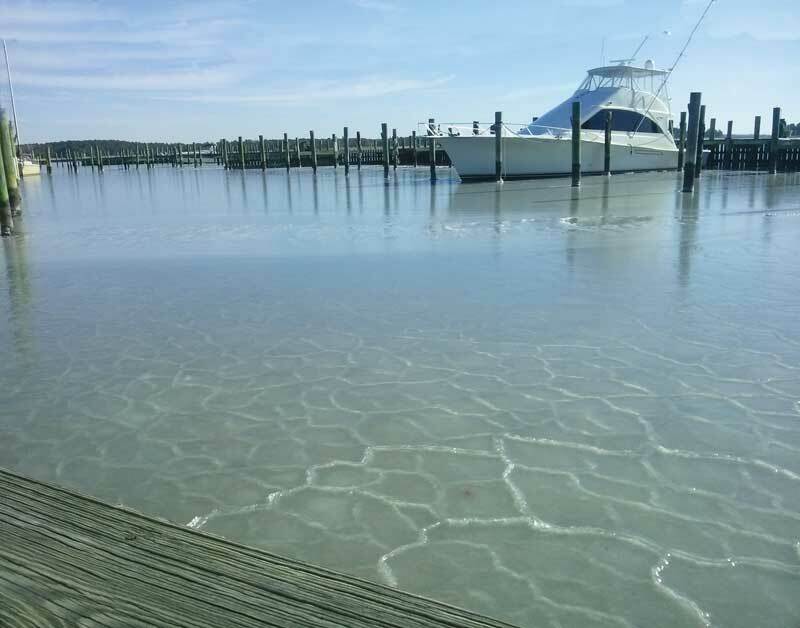 While living aboard in summer, boaters want a slip at the end of the dock, with easy access to the open water, but in winter, folks living aboard move closer to the land and the protection of the shore. There’s also safety in numbers. A pack of boats can share bubblers, fresh-water hoses, and companionship. As much as marinas are a place of community in the summer, they get empty and lonely when the majority of boats head south or get tucked in on the hard for the off season. Since marinas shut off fresh water on the docks to prevent damage from freezing, boaters who stay aboard through the winter plan ahead by stocking up with jerry cans of water and/or extending a really long hose from a water source at a marina building down the docks. A boater next to us one year strung a hose down the dock and put pipe insulation around it. It looked like a long, grey pool noodle lying on the dock. Boats, as well as their occupants, need to keep warm, and what works for one works for both. We’ve all heard the horror stories about disaster due to heaters in the engine room, but those are from boats left in the water that are left unattended. Make sure your electrical connection is secure and safe with good strong amperage, and pay attention. If the temperature of the water around the boat gets down too low, liveaboard folks know to get some heat going below the water line, in the engine room. Throughout winter, holding tanks still need to be pumped out. When we had to stay up north too long into the cold season, the walk to the marina’s restroom seemed to get longer as the temperatures got colder. Boaters who stay aboard know to use the marina facilities whenever feasible to avoid having to do a pump out cruise at inopportune times, such as when weather is prohibitive. These dedicated boat life devotees know to take advantage of any decent day to do a pump out cruise, but they also get the advantage of being able to do a relaxing cruise on those rare and treasured warm sunny days. I find myself impressed by the resilience of these brave souls and their dedication to living aboard. People who choose to live aboard full time are a special breed. They’re committed to their boat life. Some of us admire their fortitude. Some of us think they’re just crazy. Either way, they’ve chosen their full-time liveaboard life and the fun and challenges that go with all the seasons.